Ben Siwa finishes third in last year's Great Eastern Run. Whatever the weather, Sunday’s Great Eastern Run promises to be another scorcher. Again the London-based RunFast club have entered a handful of African athletes and they’re sure to once more dominate the city’s big half-marathon. Kenyans have won the last five Great Eastern Runs and are they’ll be trying hard to mke it a super six. But a fleet-footed Ugandan stands in their way. The stand-out African athletes in the men’s race are Ben Siwa from Uganda and Kenyan duo Philip Keoch and Declerk Onyambu. Siwa (26), third in last year’s race, is in red-hot form and in last weekend’s Cardiff Half-Marathon he led 26,000 runners home in a new personal best time of 62mins 07 secs. If conditions are right and he can reproduce that sort of form on Sunday then he’ll smash the course record. That stands at 62.16 and belongs to 2010 Kenyan winner Edwin Kipyego. Kenyan Keoch is another 62-minute man and is expected to push Siwa hard. Keoch (28) won this year’s Kenyan Half-Marathon Championships - the Safaricom Kisii Half Marathon - in a cracking 62:54. That earned him a prize of 70,000 Kenyan shillings (about £400) and he was also rewarded with cows, goats and sacks of maize. On Sunday it’ll just be £750 and a trophy if he wins. Onyambu (34) was the 2012 Kenyan half-marathon champion. His time then was 68.06 and there is no trace of him having run faster since. So it looks like a showdown between Siwa and Keoch. 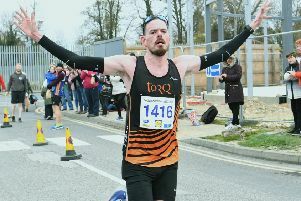 Stamford-based Aaron Scott, first Brit two years ago behind three ultra-fast Kenyans, is not taking part this year. He’s in Majorca at the moment and on Wednesday flies out to Toronto to compete in the Canada Marathon. So the first British runner home could be 38 year-old Alistair Watson from Notts AC. He was second Brit last year in fifth place in a new personal best 66.48 and a fortnight ago clocked 67.23 when finishing thrid in the big Robin Hood Half-Marathon in Nottingham behind Kenyan flyers Morris Gachaga and Vincent Boit. Dave Wardle from North Herts AC finished just behind Watson in sixth place last year and goes again. Former Peterborough AC member Glen Watts from March, now a Shaftesbury Barnet runner, has entered and he has a personal best of 66.19. But that was set four years ago. His best this year is 69.46. Kenya look set to take the women’s race spoils for a fourth year running and the runner to do it looks like being Demaris Kemunto Areba. She was second behind fellow Kenyan Lenah Jerotich in Cardiff last weekend in 71.40.